A home for parents, friends and family to remember and share all of the funny, cute, honest, precocious things that our kids say! 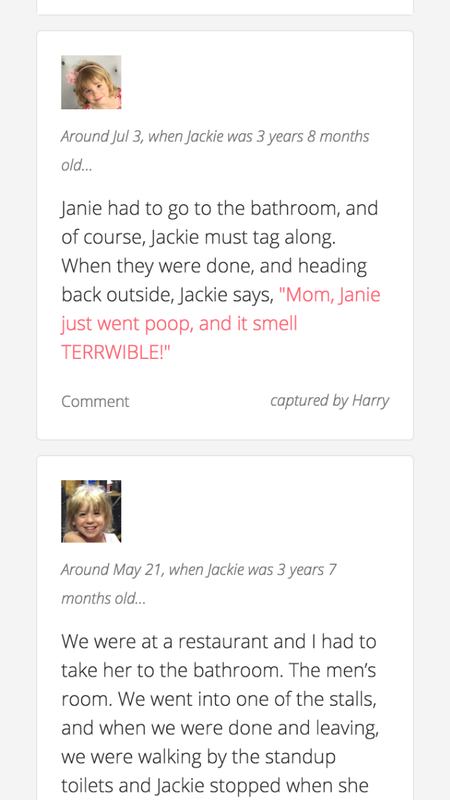 All the funny, smart, cute things that the kids in your life have said, all in one place, captured forever! We'll calculate how old they were when they said this. You can add context and highlight their punchline! 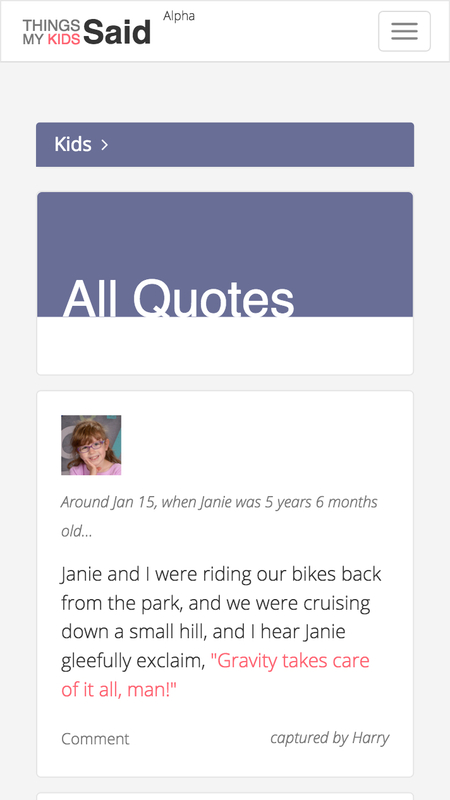 Friends & family and can enjoy reading all of your kid's quotes. They can also capture moments of their own, from the time they have spent with the kids! 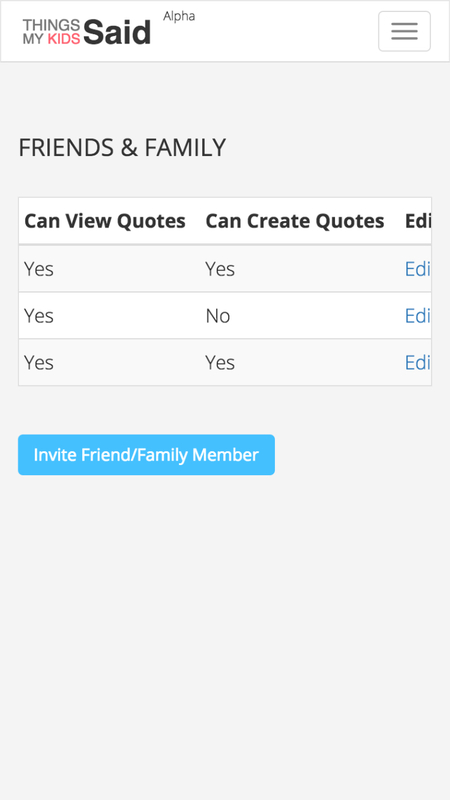 Parents can invite friends & family members, and grant them access! We are here to help you capture and share all of these moments. 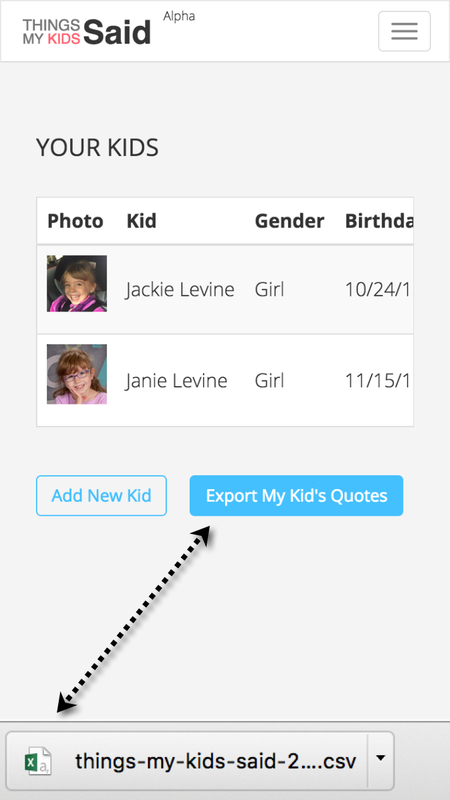 You can also export a copy of your kid's quotes onto your computer, as often as you'd like! Each quote can have its own unique picture. This way, your kid's picture will be in keeping with their quote. And, when you scroll through their timeline, you will see your kids grow, in step with their language and words growing! For convenience, adding a unique picture is optional. By default, a new quote will have the same picture as the previous quote. Things My Kids Said is a website, so you can access it from any device (computer, phone, tablet, etc. ), and on any platform (Apple, Android, Windows, etc.)! All you need to do is sign up, and start capturing all the funny, cute, honest, precocious things that your kids say!